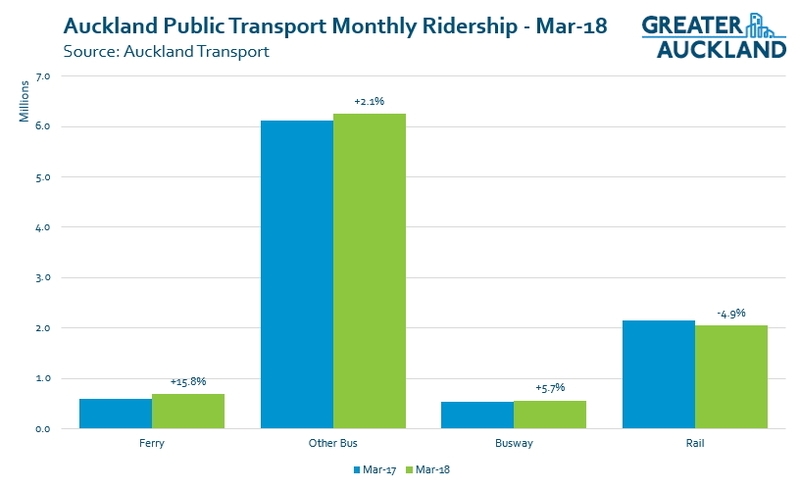 I always look forward to the latest ridership numbers from Auckland Transport but March holds a special place thanks to “March Madness”, the time of the year when the usage of buses and trains peak. I had been a little worried about the results for this March due to the combination of two fewer business days, train staff taking industrial action at the beginning of the month and there being a hugely popular series of Adele concerts last year. The latter was likely made up for by the Ed Sheeran concerts, the test cricket at Eden Park and some other events. Overall the numbers show that concern was misplaced. Unfortunately, we don’t have the full breakdown but we do have the important stuff. It shows that overall more trips were taken in March this year than any other month we’ve got data for (Monthly data back to the beginning of 2002). In total, over 9.5 million trips were made in March, up from just under 9.4 million in March last year. For each of the modes there are some interesting results. Buses continue their recent good growth, in some part due to the rollout of the new network. Buses overall were up 2.1% for March however, AT say normalising for the various differences would improve the increase percentage to 7.4%. The Northern Busway was even better, up 5.7% but no normalised figure is provided for it. This one shows the rolling 12 month totals. Over the last year we’ve had just under 92 million boardings. Positively, the three new network areas (South, West and East) are all continuing to show growth and if trends continue, we’re likely to see a surge in usage after July when the isthmus network has been implemented. It makes me wonder if next March we’ll surpass 10 million trips in a calendar month for the first time. 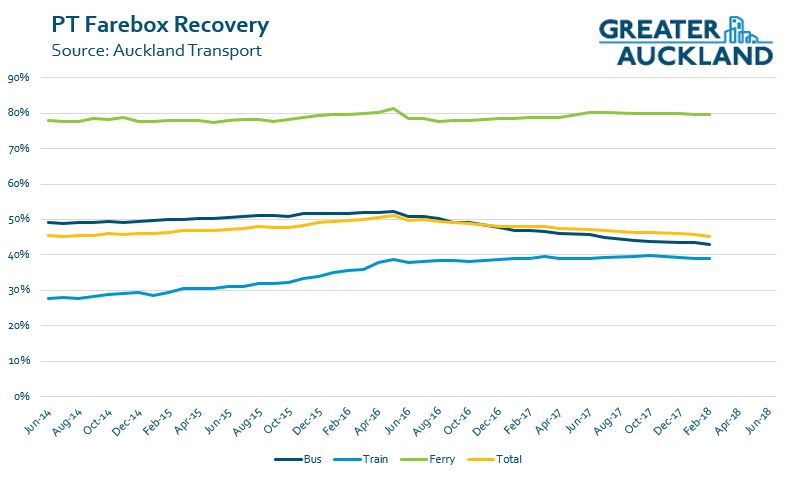 While the PT growth is positive, one thing we’re continuing to see is a reduction in farebox recovery rates and subsidy per passenger kilometre. PT isn’t the only thing showing growth either. Almost all of the cycleways that are monitored recorded their highest month ever. 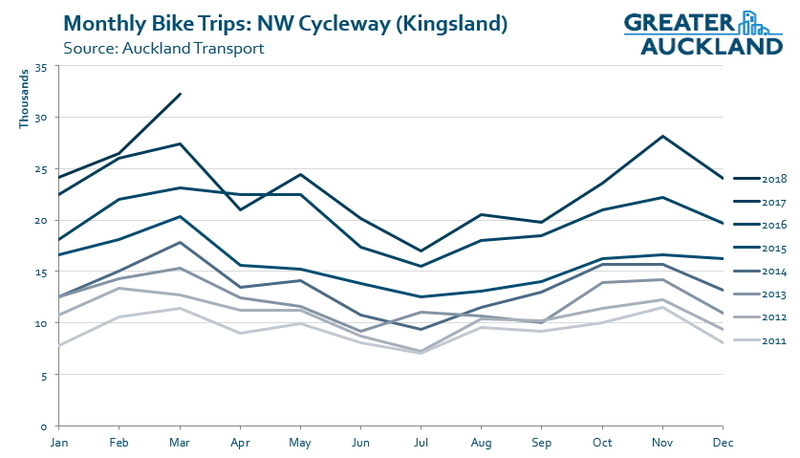 For example, this is the NW cycleway at Kingsland had over 32k trips in March, the previous highest calendar month was just 28k. On related note, NZ Bus staff are taking industrial action for the next few weeks with some routes and times affected. AT has a list of affected services. Good to see. Such a shame about the strikes. Why the continued fall in farebox recovery? The new networks have been in place for a while and there haven’t been big cost increases in the time after they have been implemented. With increased usage farebox should be going up not down. Offpeak is where we need to encourage more usage as those are likely the services running at a loss. Not just for that reason of course as the more we can get people using off peak services the more we can finally have a proper PT network with decent frequencies all day long. In respect of off peak travel, our current – opposite of rapid PT – model means a trip from work to home for me is quadrupled, at least. 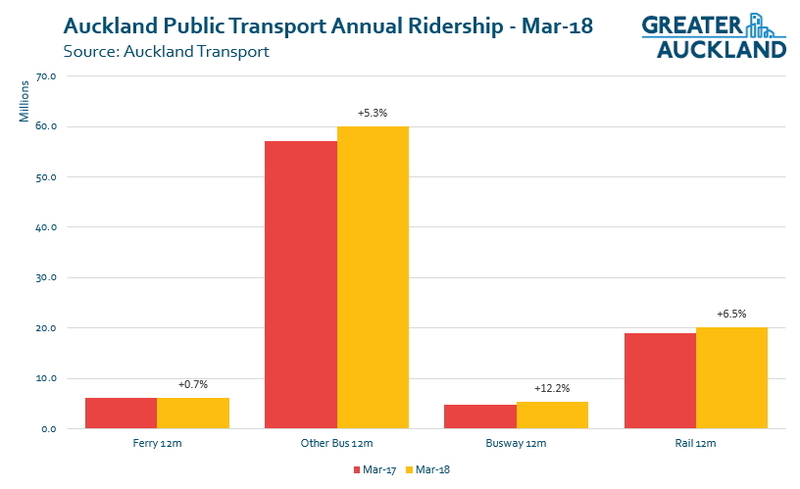 As far as I can see nothing with our current options, largely made up of buses doing well under 40 km/hr on average will change that so PT remains very unattractive. Unless they’re running on a dedicated busway, buses are never going to be a speedy option at peak times. This is why it’s important to ensure the new LRT system runs at the maximum possible speed and is not strangled with too many stops and circuitous routing in the name of “catchment”. +1, I know that some people are a fan of diverting LRT to get catchment, but we will really regret that IMO. +2, the Northern Busway runs in pretty much a straight line and doesn’t have a great catchment, yet it is hugely popular. Good analogy. It also doesn’t have a nice walkable environment near it. I suppose in asking for LR to have a great catchment, people are wanting our RT to magically provide a walkable environment, when in fact that needs RT, intensification and placemaking. +1, rapid transit enables good land use. It shouldn’t blindly respond to existing land use. Jezza, I suggest that the main reason for the success of the NEX service is that the alternative, driving, is comparatively so expensive. Most trips terminate in the city where parking averages about $25 for a day compared to two zones at $9.60 return. It would be interesting to see what the market price for parking would settle at if AT’s price was more in line with other prices and whether this would induce more to use public transport. Agree, however I doubt the Northern Express would be anywhere near as successful if it took a meandering route though the suburbs travelling on 50 – 60kmh roads, even if this took it closer to people’s homes. And don’t forget: higher frequency. Most off peak travel time is wait time. all door boarding would speed up buses full-stop, and arguably more so in the peak when there are more boardings. Why no slow down to meet timetable? You will have more of the bunching issues like we do now, from doing that. Not to mention most people along the route miss their planned bus, assuming they planned it. Only benefits people who turn up and go, if its frequent enough and doesn’t bunch from early running. Bunching is a big issue because some run early, some run late, some run on time. If its just on time or late then you mitigate at around 1/3 of the bunching issues. Yes, even on a dedicated busway due to large variation of driver ans passenger behavior. The top thing on AT’s quick operational win bus improvements list should be 1) stopping early running, 2) having driver training to ensure more operational consistency and 3) improving driver conditions so their more inclined to care. But we never see anything change, PTOM was meant to fix early running, yet nothing has happened – are operators even getting hit up about this and penalized appropriately? I would say no, or that behavior would of been rooted out by now. Maybe less farebox recovery is due to more people paying with HOP rather than cash fares? Or more Goldcard holders than ever using the PT off peak? 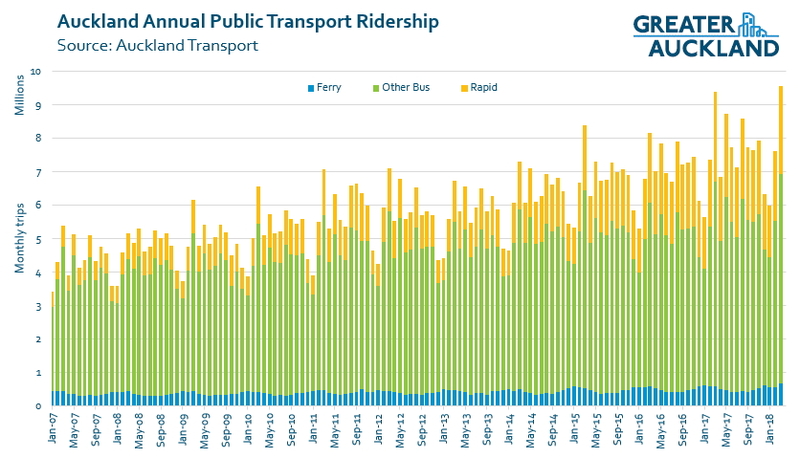 Anyway, farebox recovery levels as high as they were, and the notion that they should get to 50% across all modes was purely an idealogical stance by National that had zero science or any real rationale behind it except that to them it probably looked like the 50% farebox recovery and the 50% funding of upkeep of local roads that NZTA does sound similar [dollar for dollar matching], so should both be a good idea for PT. In any case the subsidy per passenger km is the better metric and that, for rail, has come down nicely to be below the bus level, when for years it was reversed. Shows the benefits of electrification and usage. AT should actually heavily discount off-peak traveling as the bus and train are quite empty during off peak. It is better to get some passengers at discount than little or no full paying passenger. At the end of the day the fare-box recovery may not change that much. It would also ease the overly-crowded peak service. Ferries increase could be a reflection of the continued good weather encouraging people to go to sea! It could be. The ferry data shows peaks in summer and troughs in winter, opposite to the general PT trend. Summer is the cruise ship peak. What’s the bet the tourists take a ferry trip to Devonport, boosting the numbers. It’s an increase on last March, which was also in cruise ship season, it was very wet though. Interesting point. I do wonder if the whole cruise ship shenanigans should be approached in Auckland by creating a port for them at the far end of Waiheke, and then ferrying the passengers to wherever they want to go from there, including for some, to Auckland cbd. Much is made of the fact that 600 new cars are added to our roads every week. But now we have 90 million PT boardings a year and increasing everywhere. Bike riding is becoming very popular. (me too). It would be interesting to know if we PT people are helping reduce imported oil. The true measure is the $’s we spend on fossil fuels and cut down our huge $9 billion bill for imported oil. The potential effect of electric vehicles on New Zealand’s Balance of Payments isn’t talked about enough. JimR, sadly not true that the number of vehicle trips is holding steady. Auckland Transport’s Sustainability Framework of 2017 indicates in Figure 7 that the target is to reduce millions of litres of fuel used from the current level to 1400 per year. I note that the current usage has increased by 7.7% since 2009. I think that it is reasonable to infer from increased fuel usage that the number of trips has increased. The situation is exacerbated because cars have become more fuel efficient over that period. Due to the strikes I wonder how many rail passengers transferred to rail? When the strikes happened, I just drove into town. All the train problems today, it took me 2hrs to get to work. I think I’ll go back to driving. Sorry, i get that workers are trying to get better working conditions etc, but I am getting sick and tired of all these industrial actions which punished commuters and only commuters. Go punish AT directly and stop using commuters who just wants to get to places to get your message across. Quite how do drivers, for example, punish AT instead? I would argue their target is not the public, rather trying to force change about the only way they can, to survive! That idiotic system PTOM introduced by National for route tendering has seen bus company’s turning on their staff to win contracts, by under cutting others by crunching staff wages and conditions. Why on earth else would Ritchies who specialise in undercutting everyone else be begging the government for more immigrant, and hence cheap and exploitable drivers otherwise? I suppose they have tried the AT / Transdev (is it Transdev?) route and got nowhere, hence why they now choose to strike. It’s definitely an inconvenience for commuters, but I’m okay with it – ultimately if AT doesn’t resolve these issues quickly enough, the average commuter will start putting pressure on AT too. All pretty positive still considering strikes and other issues. As a side note notice they have started on he half moon bay bus interchange. The cycleway figures are incredible. Do they ever take spot measures of e-bike share? Wondering whether there has ever been a study done (here or abroad) of the impact of introducing double deckers on a route? Like the bus equivalent of the “sparks” effect? Surely AT must have formed a view as to whether, all else being equal, d/deckers are responsible for some of the stellar bus growth in recent times? with respect to double deckers, I think there’s a need to distinguish between what I think of as the capacity effect (more seats) vis-a-vis the legibility effect (more visible). Additional capacity on busy routes is highly-valued; evidence shows that the perceived cost of in-vehicle time approximately doubles as vehicles approach crush capacity. That means that what would normally be experienced as 10-minutes of travel-time is actually perceived to be 20-minutes. Or to put it another way: Where additional vehicle capacity alleviates crush loadings and obviates the need for passengers to stand, then you have effectively halved the in-vehicle time. In terms of the visibility effect, I think this is also relevant, especially for attracting new users, in a similar way to the way that light rail stands out when it is implemented in otherwise busy bus networks. The sheer legibility of the service means that it stands out and attracts more passengers as a result. Although one does wonder if, as double deckers become more ubiquitous, this effect will wear off somewhat as people become used to them? I mean in cities where light rail is common-place I find fewer people talking about legibility, perhaps because the much of the network becomes similarly legible? I believe that yesterday Minister Twyford told an assembly of local bodies that the government has significant expectation that they will reduce car mode share. In that same speech I believe he also indicated that the government would loosen the current farebox recovery targets. 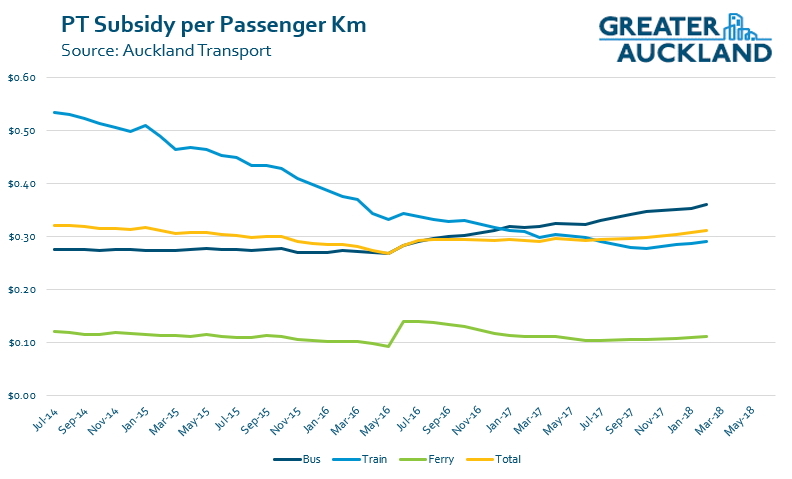 Yesterday Associate Minister Genter spoke of the tremendous benefits from the greater uptake of public transport. Amongst other things she spoke of greenhouse emission reduction, pollution and the economic benefits for users. The rules have changed. The government is definitely pursuing a different path and it is difficult not to be impressed by the passion with which Ms Genter speaks of that change. I currently have an OIA request with AT regarding sustainability issues and it will be interesting if they are being dragged to embrace change. Sounds promising, not sure if public Joe is hearing & understanding this message though yet.